I usually don't like the world of SEO and marketing, reason being anyone with enough money to throw can make absurd things popular. Have you seen useless Facebook pages with little to no updates but an immense audience, websites with great Alexa rank and traffic yet no useful content, celebrity pages with ridiculous likes and followers. It all happens in the backyard of the Internet. It's all like a surface of Deep Web. Okay I went too far. But I hope you get the idea. So I am here to disclose something which people think is long dead. Backlinks. If you are into SEO and or have been into it before you must be aware of how Google penalizes pages with weird backlink activity and they even hide the keywords details now. They restricted ways to hack into search results. And I think it was all for good and still is. It significantly improves the search results and you are less likely to wander among useless websites. Simply the search results are more dependent on Domain Authority, value and it's previous content. 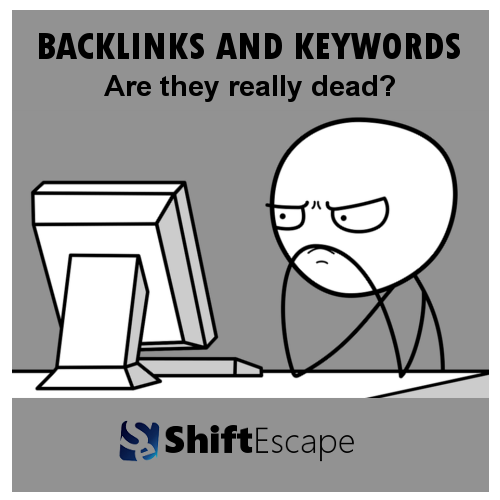 But recently I happen to realize backlinks and keywords aren't really dead. You still have chance to trick your way into top Google results. No previous registration of the domain either. This took longer time than one would normally expect. We went through numerous topics and it was really difficult to chose one. Then how did we do it? We did and extensive research on random topics using keywords tools like aherf or you can use Adwords Keywords Planner. I think it's pretty obvious step. Blogging is the easiest possible way into the Google Search results. But we did not just start writing anything. We did a preper keyword research to find keywords with low competition yet high search volumes. This can be done for free using Google Adwords. This is one part you have to be careful with. You do not go berserk buying random backlinks to your blog or website. You need just a minor amount yet quality link backs. Hence the phrase Quality over Quantity. How? What ever you are targeting through you website just go through similar websites and blogs and leave a genuine comment and hope they have do follow link back. Don't waste time checking whether some site has do follow link. The objective is to just leave in the comments. Whether it's do follow or not, you will still benefit a little from it. People still do it, and they will continue to do it. There is no possible way to stop exploitation of this. After all you cannot expect all the rain without a little mud.